Sales Overview - The sales overview of the organization, according to required segments. The reports can be exported. Bookkeeping Entries - The balance and journal reports of the organization. 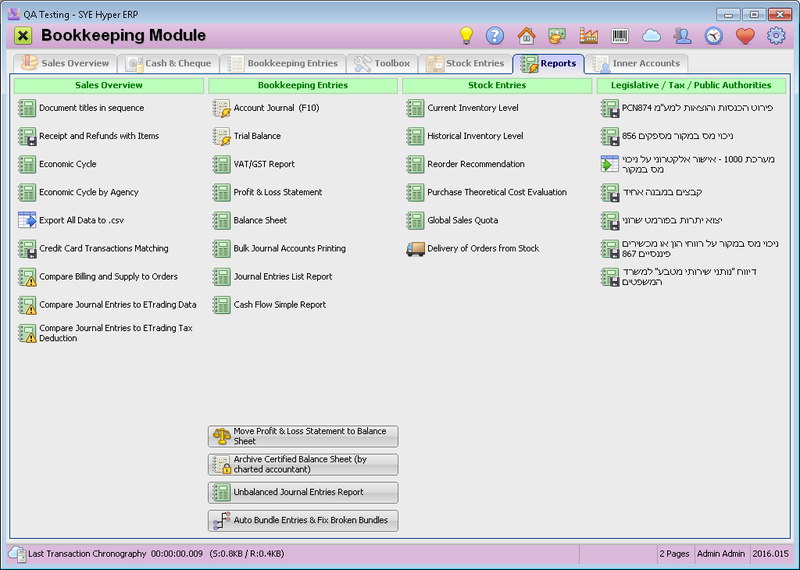 Stock Entries - The inventory reports for organizations that manage inventory and stock rooms. Legislative / Tax / Public Authorities - The required reports for the regulations and authorities of the organization state. Document titles in sequence This report gathers and displays the required formal documents, according to the selected dates, agencies and client details. The information of this report is also displayed in the Sales Overview tab. For further information Click here. Receipts and Refunds with Items The reports displays the receipts and refunds , according to the selected dates, agencies and client details. For further information click here. Economic Cycle This report gathers and displays all of the deals and receipt items, for the services and goods that have been provided to the customer, in the selected dates. For further information click here. Economic Cycle by Agency This reports gathers and displays all of the deals and receipt items, for the services and goods that have been provided to the customer, in the selected dates and for each of the agencies. For further information click here. Export All Data to .csv This option creates .csv files of the following documents, for required dates: Invoice, Credit Invoice, Receipts, Receipts Items, Refunds and Refunds Items. For further information click here. Credit Card Transactions Matching This report displays the credit card clearing records for the selected dates. For further information click here. Compare Billing and Supply to Orders This report is used for following the partially paid orders. For further information click here. Compare Journal Entries to ETrading Data This report was designed for comparing the profit/loss values of the Journal Entries and the ETrading Data. For further information click here. Compare Journal Entries to ETrading Tax Deduction This report was designed for comparing the profit/loss values and the Tax Deduction value of the Journal Entries and the ETrading Data. For further information click here. Account Journal The account Journal provides a wide information and details about all of the accounting activity of the client and allows to view and modify any of the client entries (according to authorizations). Also, the account journal is used for bundling entries, producing reports and exporting the accounting data. For further information click here. Trial Balance The trial balance is used for checking the accounts of the company, in order to verify that the company is balanced. For further information click here. VAT/GST Report This report displays the total VAT / GST calculation for the required period of time. For further information click here. Profit & Loss Statement This statement calculates and displays the total income and the expenses, as well as the Net Profit for the required period of time. This report is usually produced On a quarterly / yearly basis. For further information click here. Balance Sheet This report includes the Assets and the Liabilities & Equity, from the beginning of the current year until the required date. For further information click here. Bulk Journal Accounts Printing Create an Excel file of credit, debit and calculated balance, for the organization accounts as well as for its clients and suppliers accounts. For further information click here. Journal Entries List Report This report displays all of the journal entries, according to the required filters. For further information click here. Cash Flow Simple Report The report displays the expected cash receipts according to the selected accounts. For further information click here. Current Inventory Level The report displays The current inventory for required item / stock room / agency. For further information click here. Historical Inventory Level The report displays the inventory for selected item / stock room / agency, until the required date. For further information click here. Reorder recommendation This tool is used for checking the current available inventory, and receive a recommendation for reorder, according to the items definitions. For further information click here. Delivery of Orders from Stock This tool is used for delivering orders from stock, according to the current inventory, and for producing the delivery notes accordingly. For further information click here.